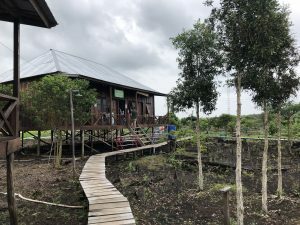 The Sumatra Merang Peatland project in Indonesia is restoring 22,000 hectares of critical peatland. 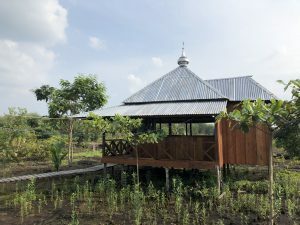 Climate finance is being used to rehabilitate and protect this critical ecosystem, preventing the release of significant volumes of emissions, in addition to creating a conservation area for hundreds of unique and endangered species such as the Sumatran Tiger. 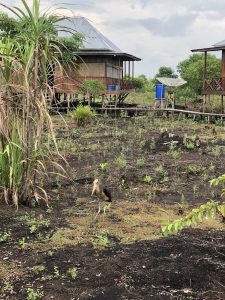 This project works with surrounding villages through a community development fund, which supports community-selected projects and creates new livelihood opportunities to reduce the drivers of deforestation and the risk of wildlife poaching. 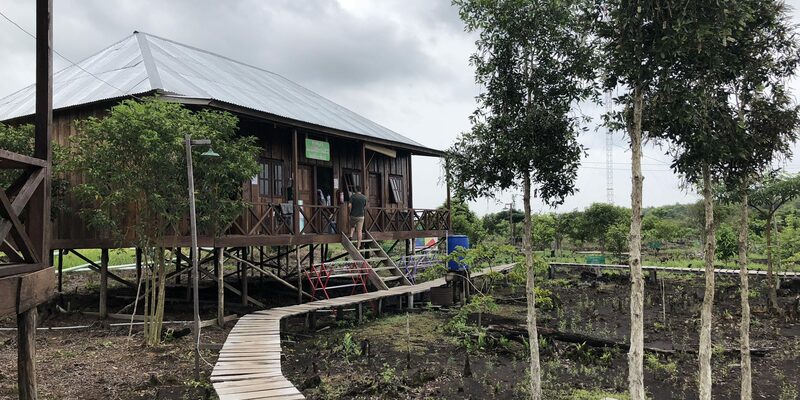 The project area is remote, only accessible by boat, and base camp is located in the south west of the project area, from where the conservation and restoration work is coordinated. 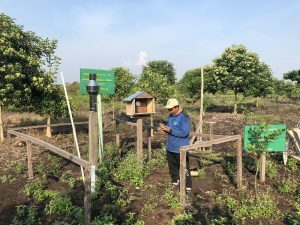 Learn more about our Sumatra Merang Peatland project here. Base camp is home to around 30 staff members who live onsite for up two weeks at a time. 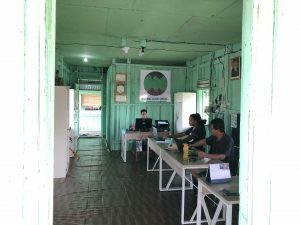 The layout of the raised wooden buildings (sleeping quarters, office buildings, storage and a canteen) set in a circle around a central garden make it feel homely and the atmosphere amongst the team is familial and fun. The central garden between the raised wooden buildings, has been planted with trees by staff members and visitors. The trees will grow to provide shade and a jungle atmosphere. 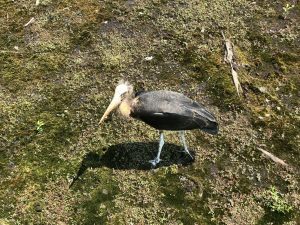 This orphaned Storms Stork, one of the rarest stork species in the world, was rescued on a trip down the Merang river and became the unofficial camp mascot while it was fed from kitchen scraps until it was able to be released back into the wild. It is estimated that only about 250 individuals remain of this critically endangered species in Indonesia, which make up more than half of the wild population in the world. Although tree planting is not a core activity of the project and the landscape is mostly being encouraged to recover naturally, there is a tree nursery at basecamp which provides trees where it is necessary to plant and encourage particular species growth, and also for shade trees at basecamp itself and at the guard posts. The office is where the best WiFi signal can be picked up! Many of the staff either hold meetings in the adjacent conference room, or do some of the desk work that is required while not in the field. 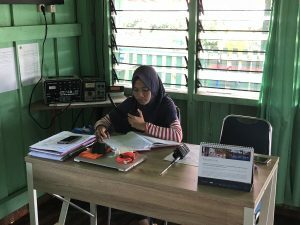 Manda is the radio operator for the project and her beautiful silvery voice provides reassurance and information to people across the project area including guard posts, surveillance and peat measurement teams. One of the biggest risks in the area is of fire. 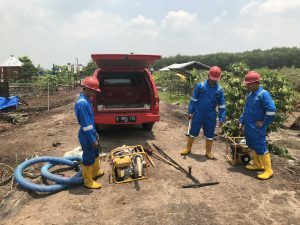 Between June and October 2015, an estimated 2.6 million hectares burned in South Sumatra, which wiped out more than half of the standing forest in the project concession. 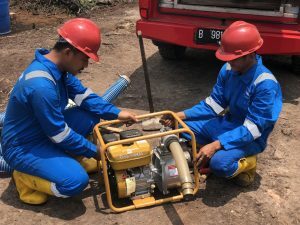 Fire training is provided as part of the project to allow quick and effective response to outbreaks that ultimately release more carbon into the atmosphere. 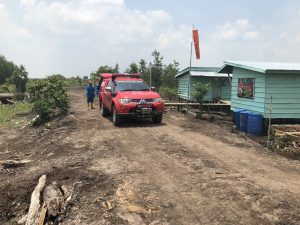 A specially converted fire truck is kept at basecamp, and regular fire drills ensure that the team is ready to react to any reports of fire, either on the project site or on neighbouring plantations. Local firefighters are trained, giving a skilled livelihood to those who may not have previously had one. 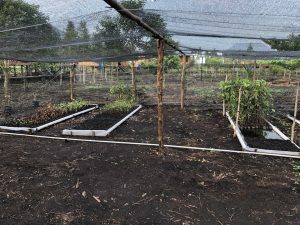 Keeping track of the weather daily is important to understand climate change and how the project might need to adapt, or indeed be mitigating it. 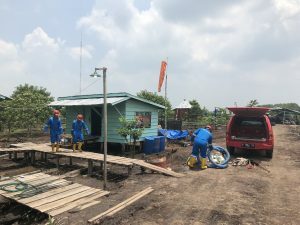 This picture shows Arief recording the temperature and rainfall. 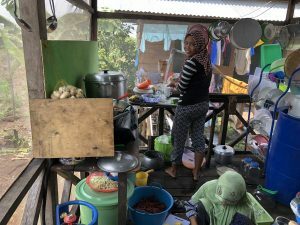 People from the local community have been given employment at basecamp for non-technical work to start, like in the kitchens, and over time are often trained up to take on more project critical work. Basecamp has its own mosque, and prayers happen each day. Over 87% of the Indonesian population identify as Muslim. 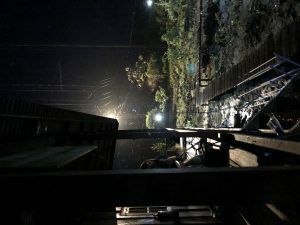 The verandas on the wooden buildings of base camp provide a perfect place to wind down after a long day in the field, especially when there is a much needed rainstorm to break the heat!